Thanks for stopping by today. 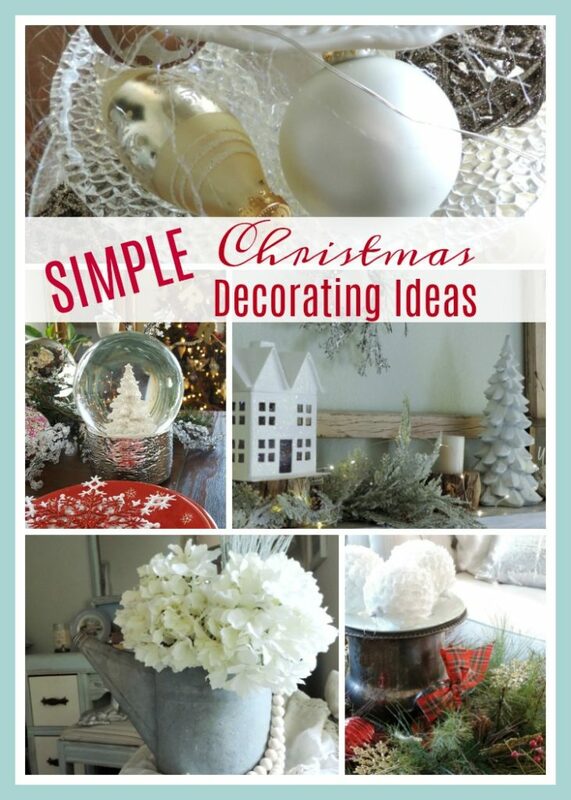 I am excited to share a few of my simple Christmas Decorating Ideas. I tend to lean towards sentimental Christmas decor. Things that have been handed down from one generation to the next. 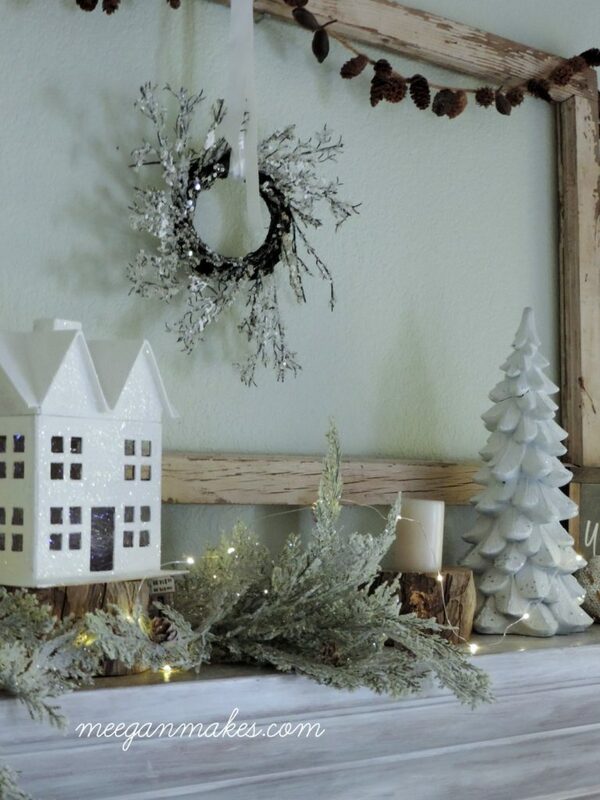 With simple Christmas Decorating Ideas, you can create family traditions for years to come. 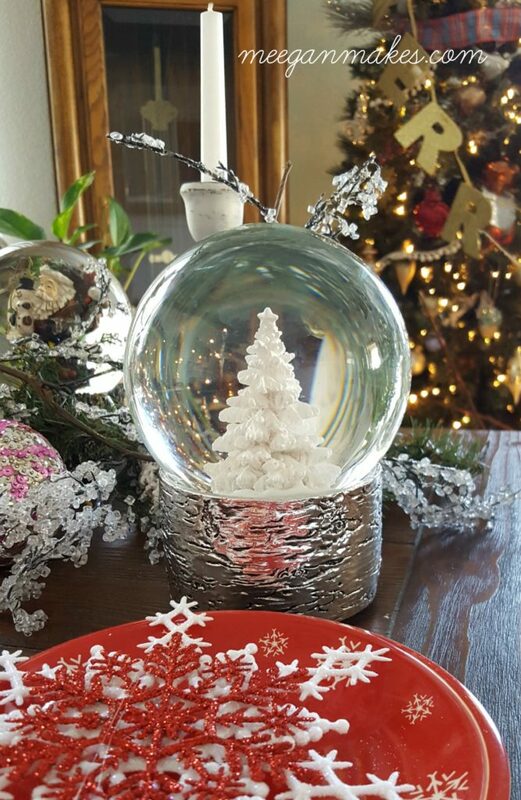 Vintage ornaments, blankets & collections make memories for all ages. It is part of who I am, family memories and traditions for my own children to carry on. 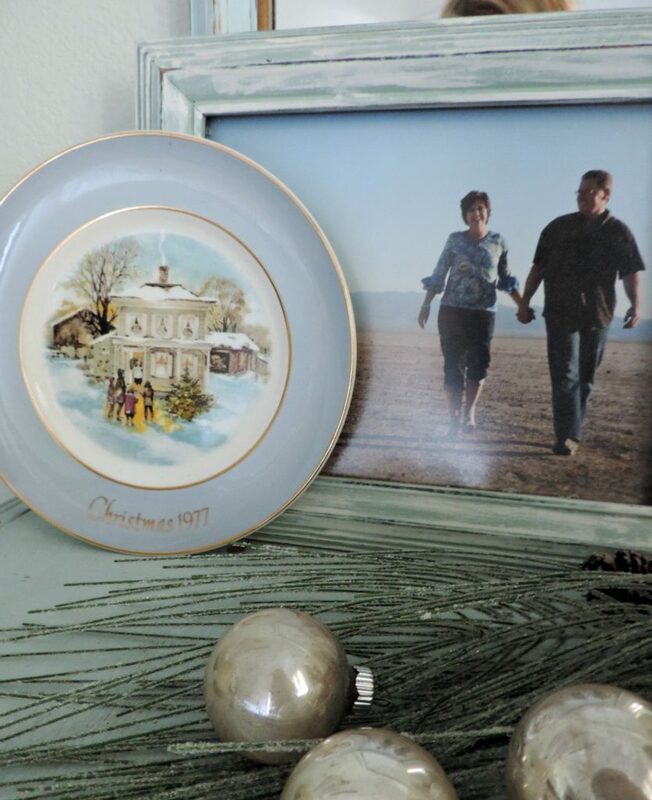 For instance, this picture of my husband and is flanked by a Christmas vintage style plate with the year that we were married. We have it sitting in our master bedroom. Simple and meaningful to us and our lives. The ornament was made by my grandma for our first married Christmas. It is brought out every year. A tradition we will carry on for years to come. The mantel above our bed is filled with greenery, candles and small reminders of our Christmases together. Layering quilts, afghans and tables cloths made by my Grandma adorn my cedar chest. Topped with a galvanized water can that was a gift from my husband. It might not mean anything to anyone else, but each of us knows-and that’s is all that matters. 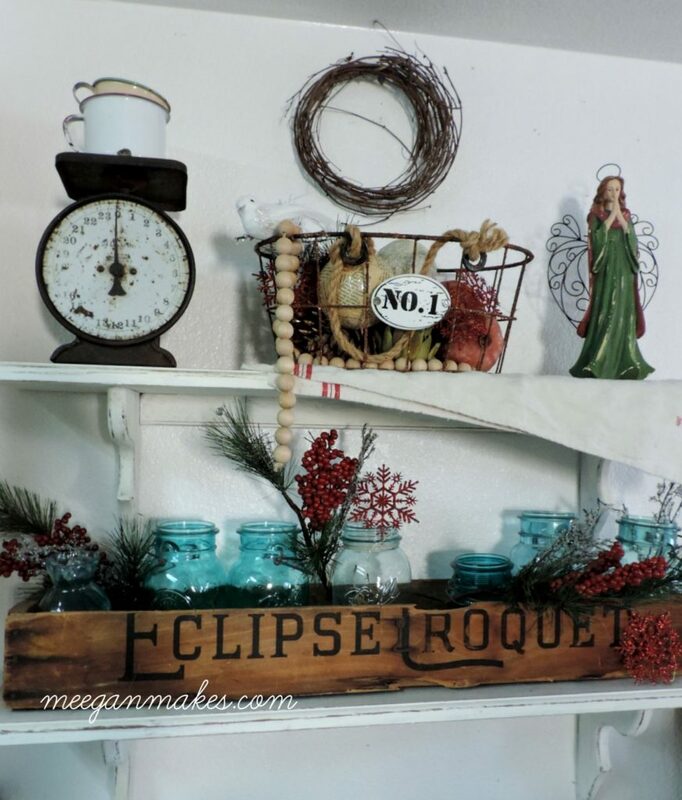 It is another way to create Christmas Decorating Ideas. My husband has collected snow globes with music boxes for years. At Christmastime, I display them throughout our home. This year they are the focal point of our Christmas tablescape. 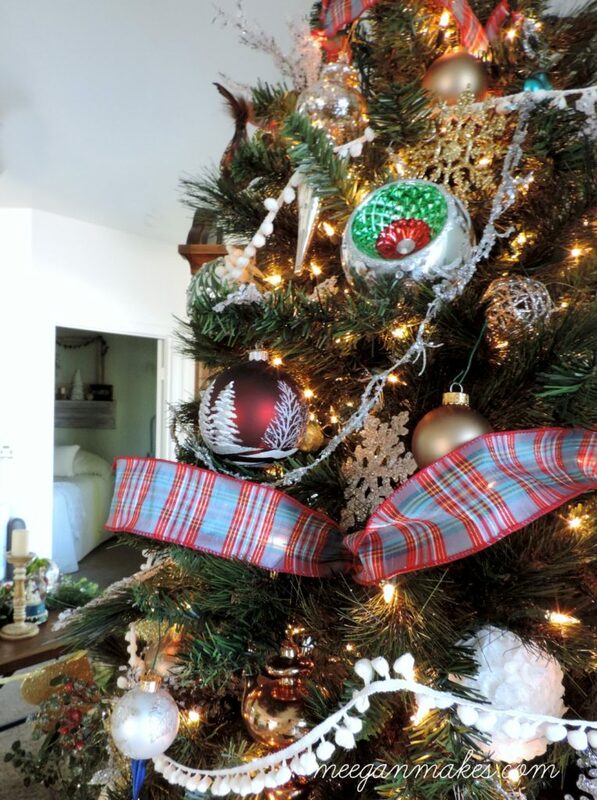 Our Christmas tree is filled with vintage ornaments, ribbons and things that bring us joy. I will be sharing more about my two Christmas trees next week-s stay tuned. 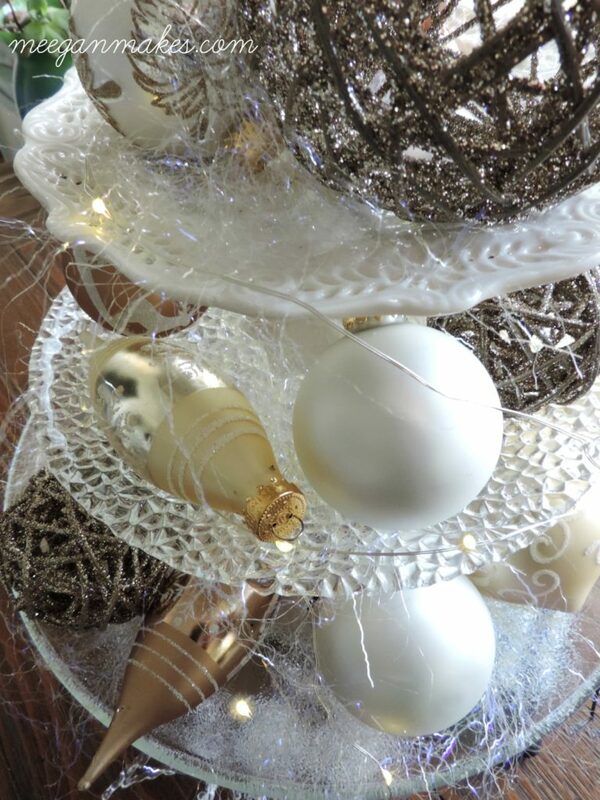 Using vintage style Christmas ornaments I styled a tiered centerpiece. 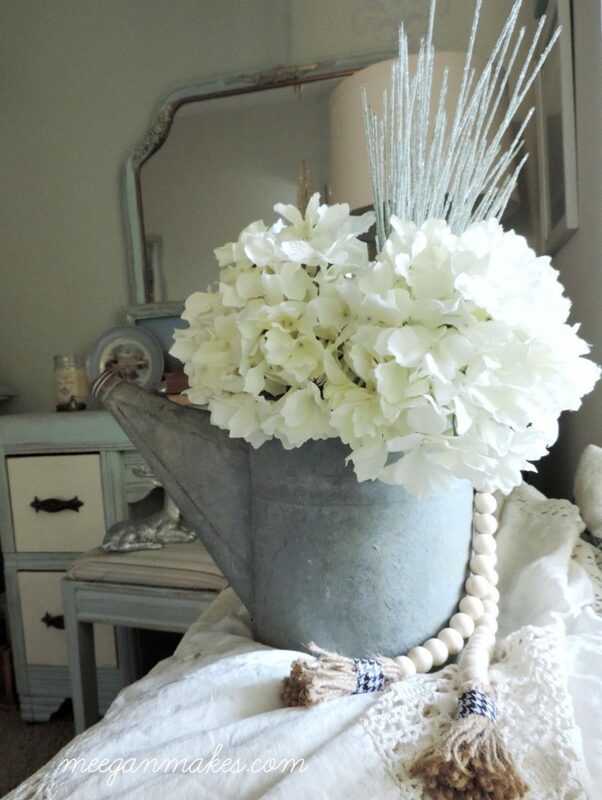 Vintage ribbons, bows and ornaments fill glass vases and pretty vessels. 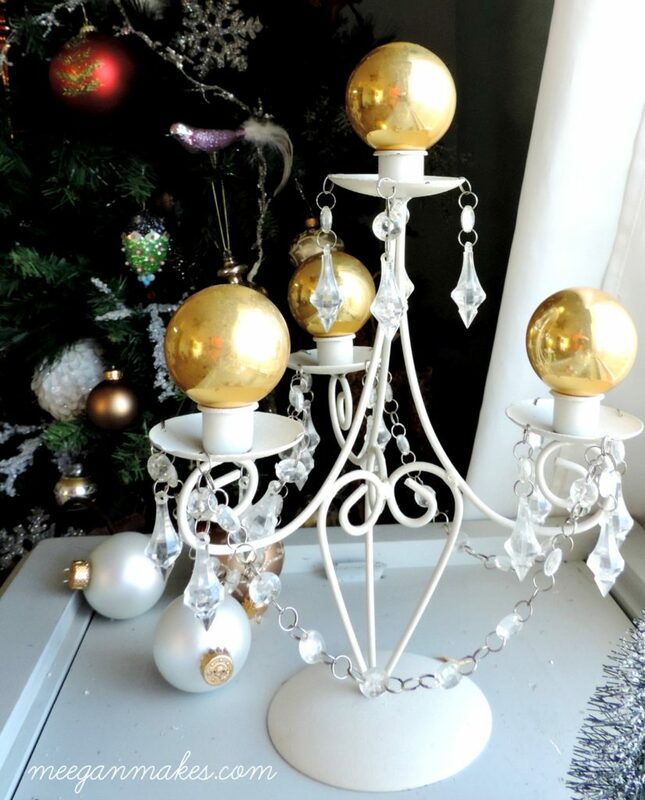 Vintage glass ornaments that were used our first years of marriage fill my candelabra. 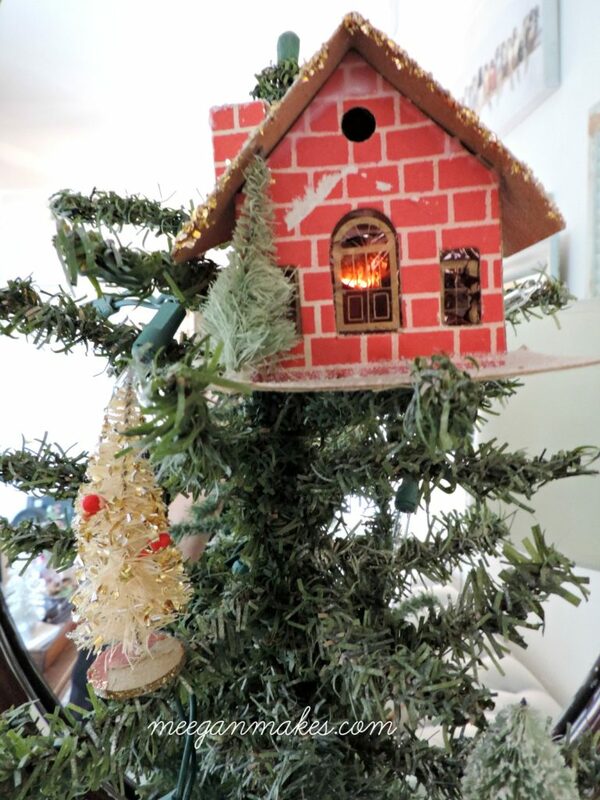 Vintage village pieces now are used as decorations for a small Christmas tree. 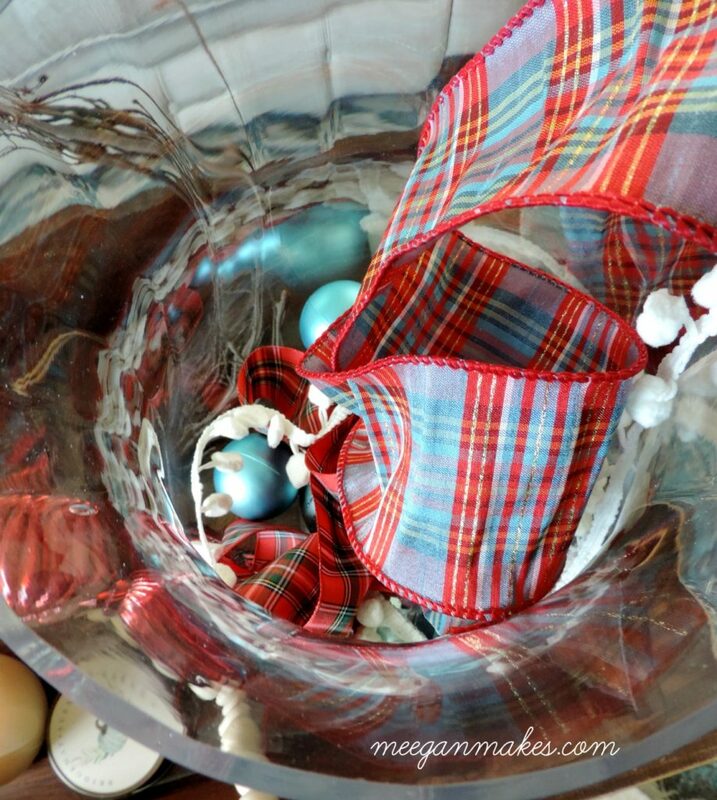 Plaid ribbons and sentimental ornaments fill my champagne bucket to add a traditional feel. I use my grandpa’s croquet box for just about every season. It’s just another way to bring my family memories with me along through the Holidays. 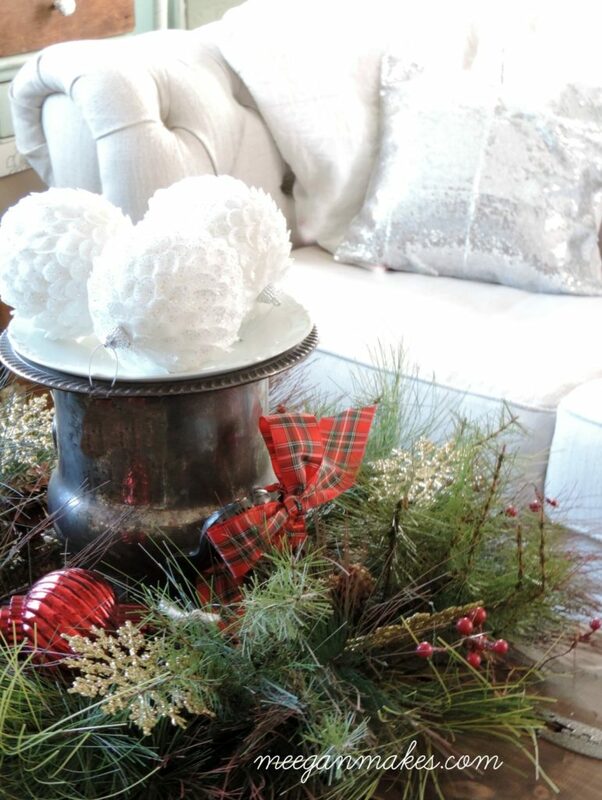 These simple Christmas Decorating Ideas can bring joy to our family, children and grandbabies. And it is a great way to share family history and fun memories of Christmases past. 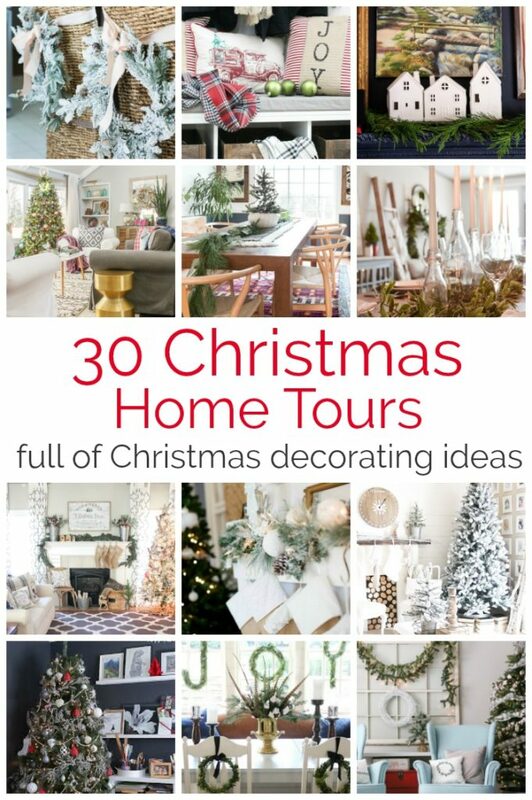 For MORE Christmas Decorating Ideas, check out my talented blogging friends below. AND did I tell you that you have a chance to WIN a $300 PayPal Card!! I know, just in time for buying Christmas gifts. Awesome, huh? Meegan, there are so many fun things to look at! The mantel area is beautiful!! 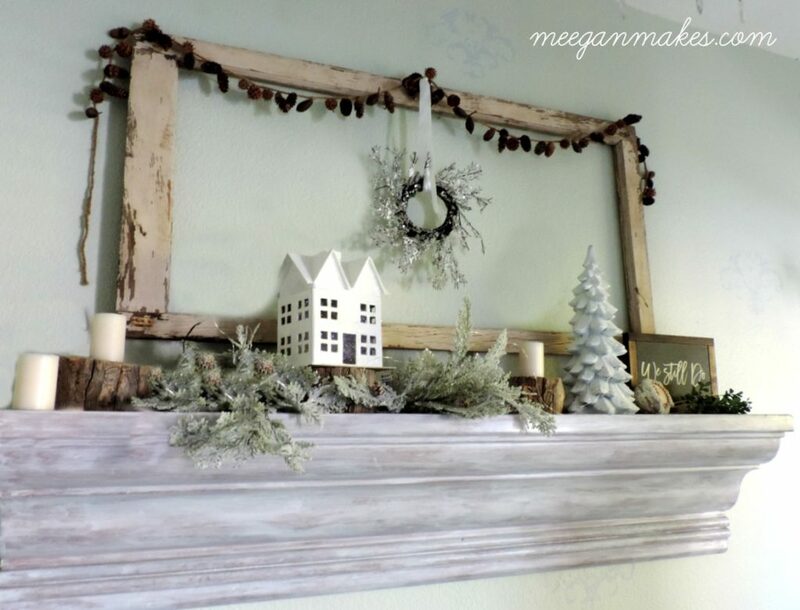 Absolutely love your Christmas mantel Meegan! Love the picture frame and that white house. Your champagne bucket centerpiece looks great too. I love all of your sentimental decor, Meegan! It’s so sweet and makes the holidays all the more special knowing that each piece has a treasured past to it! That croquet box is amazing! Your Christmas decor is so sweet and warm Meegan. I really enjoyed hearing about all your family heirlooms and special ornaments. We had to leave most of our family treasures in long term storage for safe keeping but I can’t wait to get my hands on them when we move back to the states. Happy holidays and Merry Christmas friend! I am so enamored with those vintage angels….I love special little details like that with a story. Merry Christmas, friend. Your Christmas accessories are beautiful! 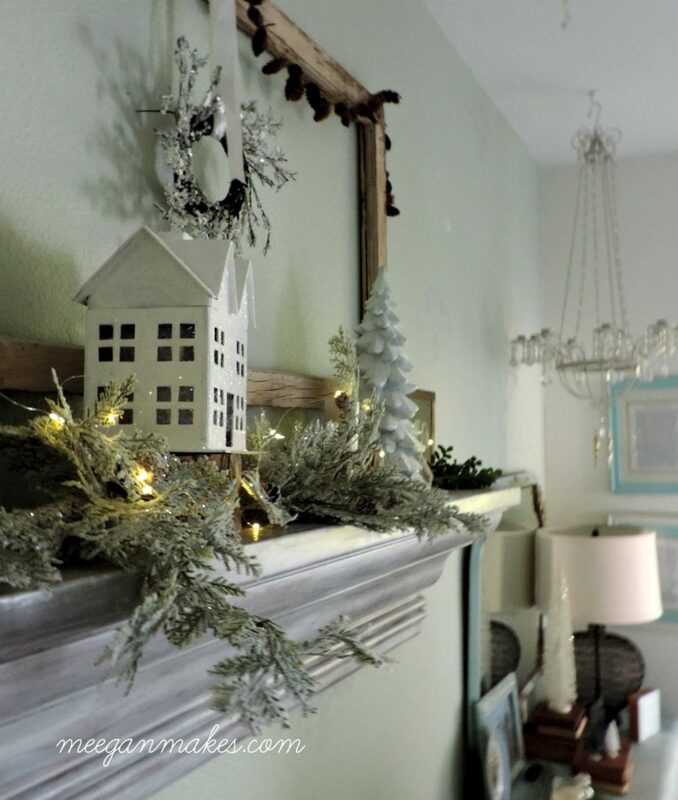 I especially love your mantle :) Happy Holidays! 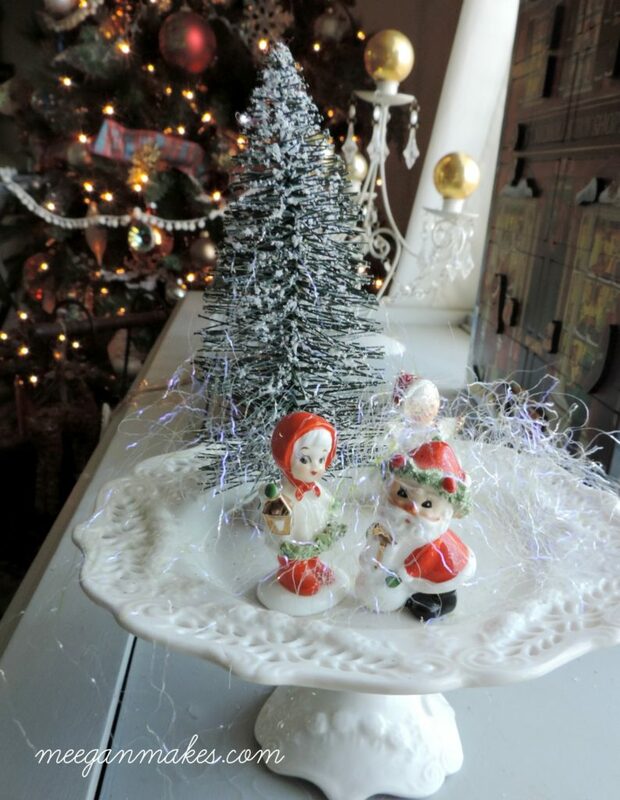 I love all the vintage touches – I think the details are what makes Christmas decorating so special. 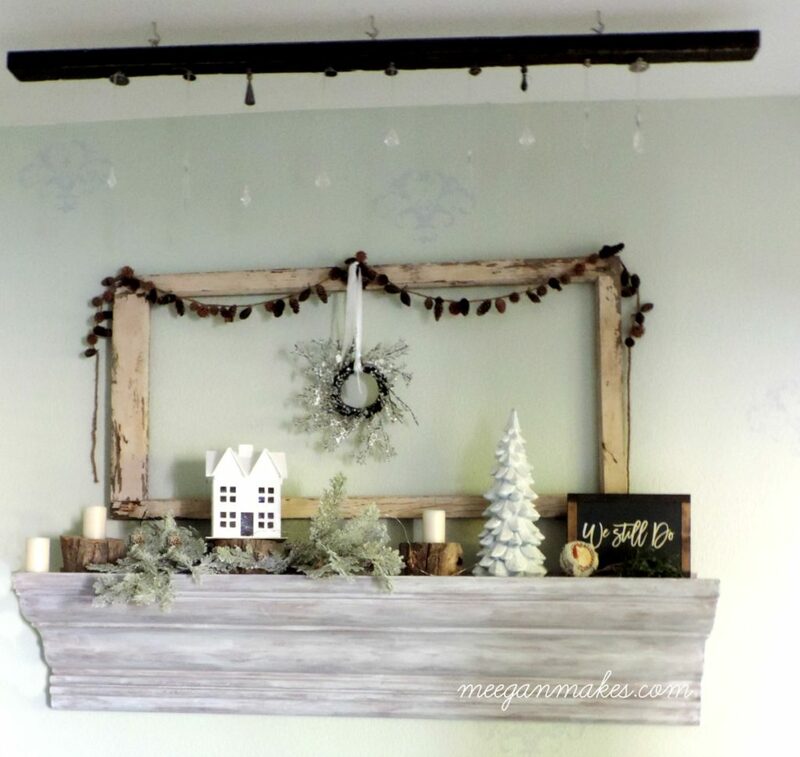 And I love the mantel above your bed – such a gorgeous focal point. 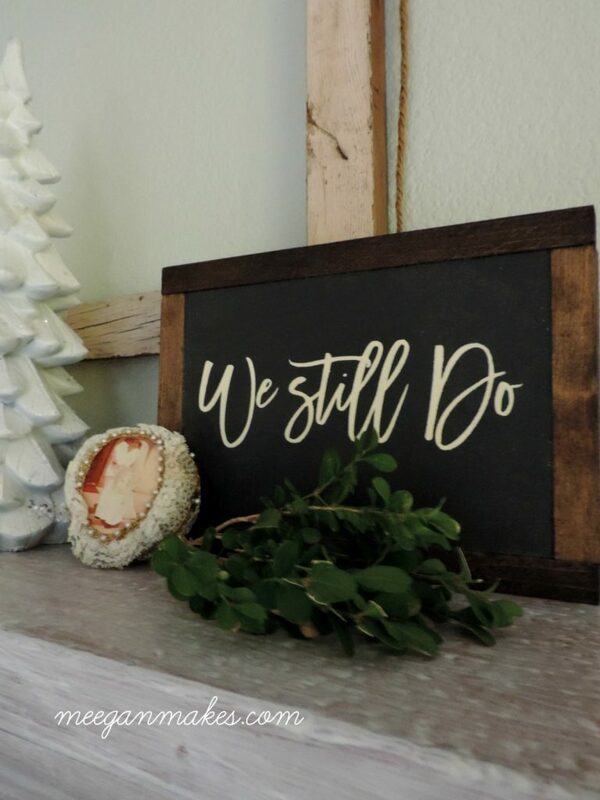 I love how your meaningful your Christmas decor is! So thoughtful!